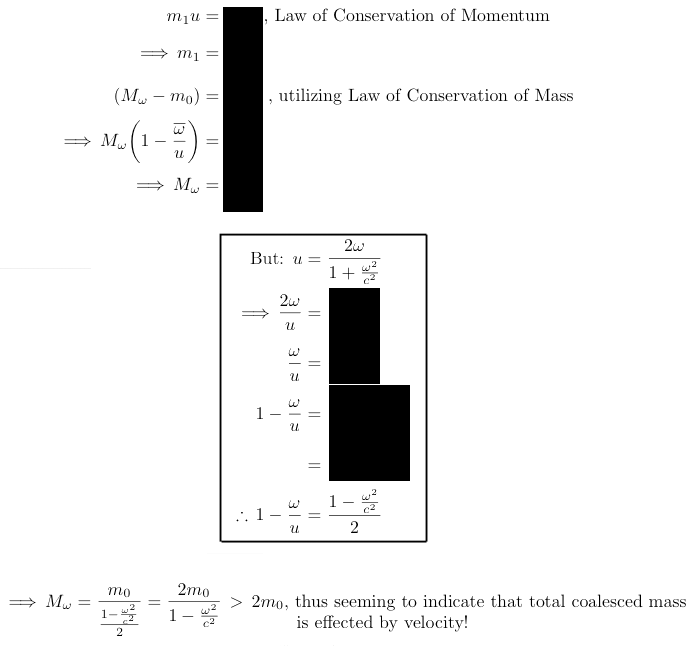 At velocities approaching a fractional but noticeable amount of the speed of light, , it's incumbent to maintain both the law of conservation of mass as well as the law of conservation of momentum under conditions utilizing the law of additions of relativistic velocities. 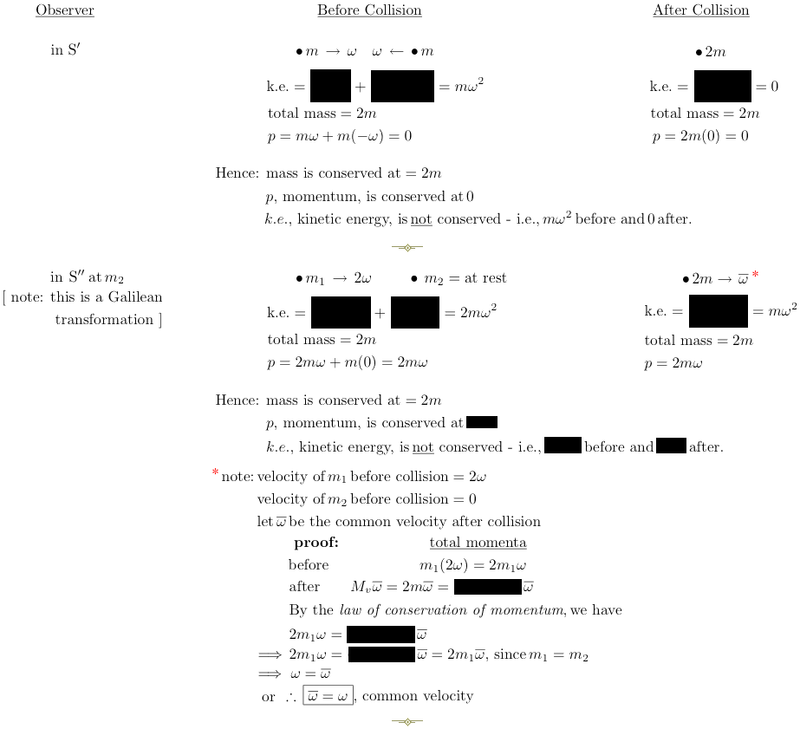 § Assume further that immediately after the collision both coalesce into one larger mass-particle, - i.e., an inelastic collision. Remember this: if you stay with a body ( or particle ) of mass, called proper or rest mass , the amount of mass is constant! Common sense. It is only when you are stationary and stand back, so to speak, and then measure the amount of mass a moving body ( or particle ) has, that you will both observe and hence measure different amounts of mass directly related to the velocity of the passing body of mass!! 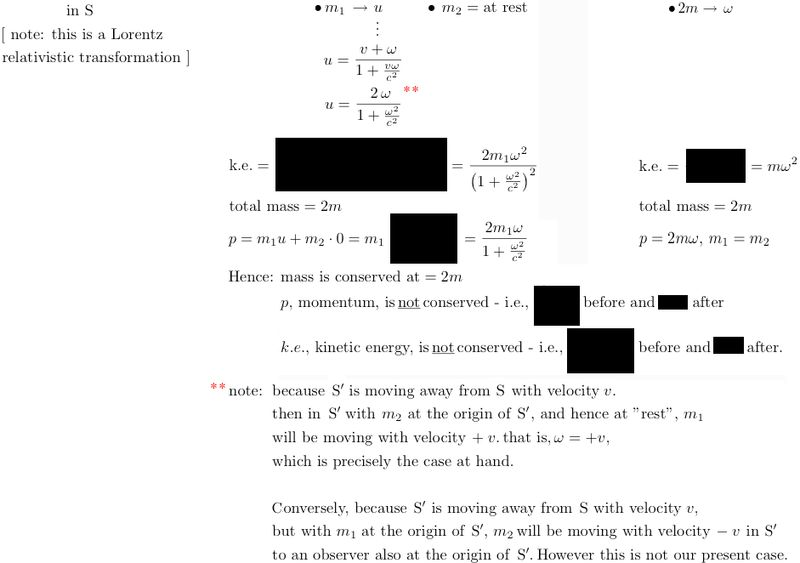 Different observers moving at relatively different velocities to the passing body ( or particle ) of mass, will therefore observe and measure different amounts of mass . 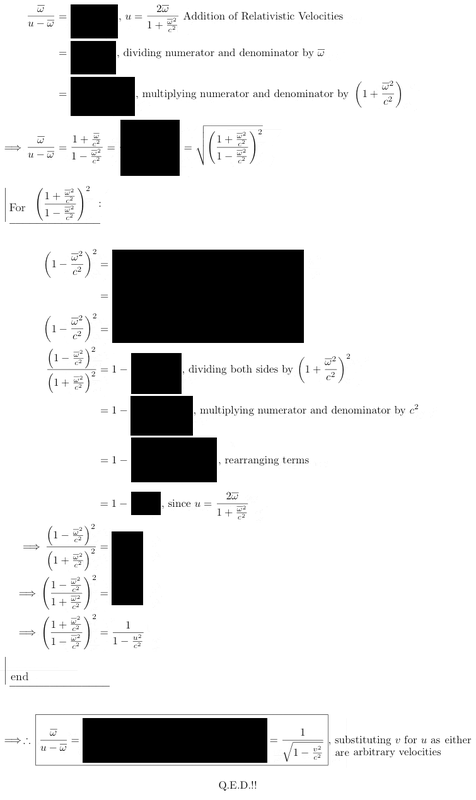 The constancy of rest ( or proper ) mass is otherwise proven due to the "Invariance of the energy - momentum vector" which is another way of saying that the total energy of a system is always constant. And, therefore, rest or proper mass is always a constant! 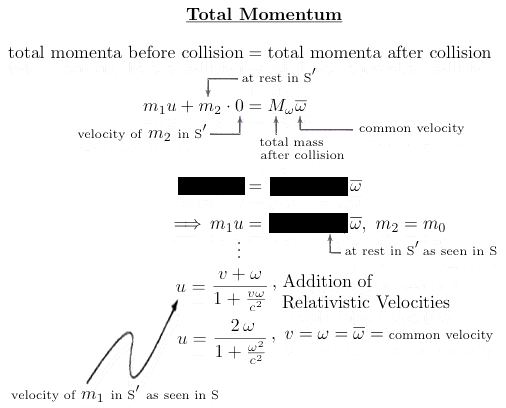 But, mass ( of body or particle ) in motion is always a speed - dependent variable!! 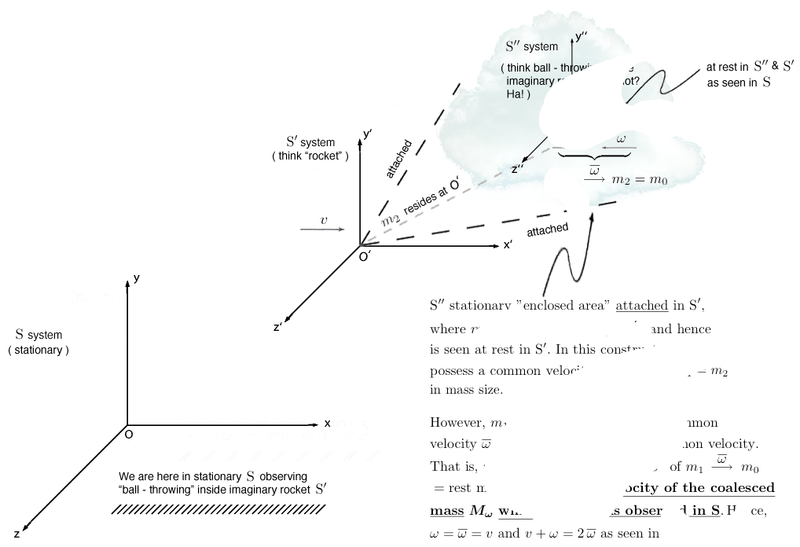 Directly dependent upon relative motion to an observer or observers, plural. Question: what therefore exactly is 'mass'? In fact, the entire physics world is awaiting the LHC - Large Hadron Collider - to eventually answer this question: what is 'mass' ?? Also, what makes 'gravity' ? Well, not exactly ... See: Einstein's "Principle of Equivalence" as between acceleration and gravity at 'Reinterpreting Galileo and Newton's Principle of Relativity'. Again: the LHC will hopefully answer this profound physics and philosophical question during the next decade. "Einstein's Theory of Relativity", by Max Born ( 1882 - 1970, born Jewish - German, converted to Lutheran, still considered Jewish by German Nazis, close and brilliant lifelong friend of Einstein while Extraordinarius Professor of theoretical physics at the University of Berlin, grandfather of Australian singer and actress Olivia Newton - John, awarded Nobel Prize in Physics in 1954 ), copyright © 1965, Dover Publications, Inc.
"The Special Theory of Relativity", by David Bohm ( 1917 - 1992, born Jewish American, Manhattan Project, Israel's Technion ), a close Einstein colleague at Princeton University's Institute for Advanced Study, copyright © 1965, 1966 by Sarah Bohm.